Country porch decorating ideas remind us of rural life, blue skies, cool breezes, wide open spaces, front porch verandas, colorful flowers, and rocking chairs. While we all cannot live in the country and enjoy this kind of life, this does not mean that we cannot bring a little bit of the country to where we do live. Can you just feel the breezes and that feeling of home? 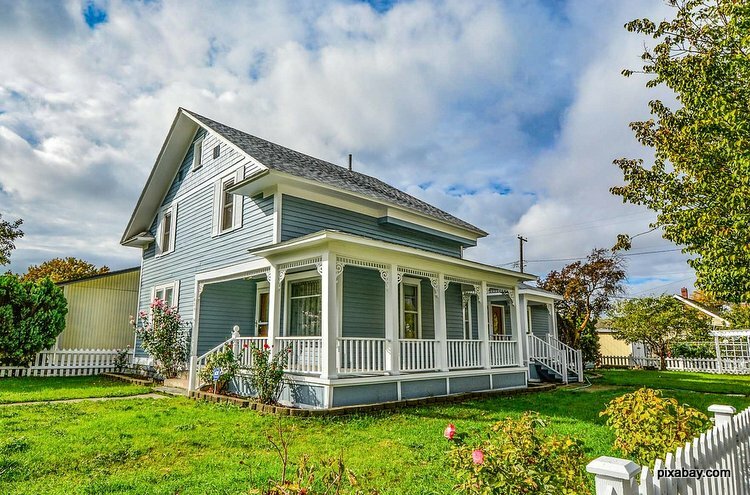 By using a few country decorating ideas, you will be able to create your own "little piece of heaven" right on your front porch no matter where you live. 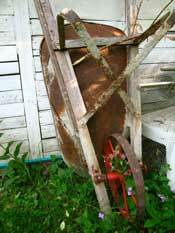 There are many decorative items like wind chimes that can be used on your country porch. Visit your local Farmers Markets or local flea markets to find old, weathered accents such as hand plows, watering troughs, tables, wash tubs and buckets. You will be surprised at the treasures you could find. 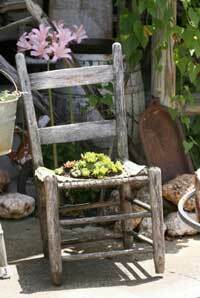 A great country porch decorating idea is to take old treasures you have and fill them with flowering plants. Dependong on size, arrange them on your porch, steps or yard creating a welcoming relaxing feeling. Use containers of various sizes, styles and textures to achieve the greatest look. 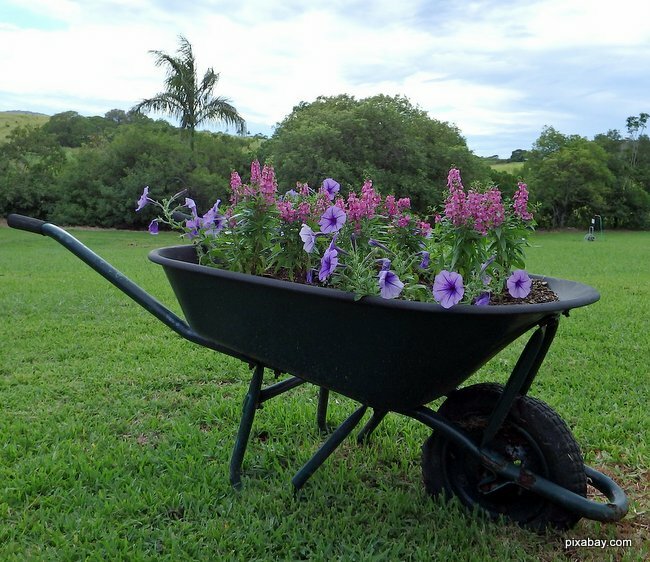 Be creative; use old wagons, wheelbarrows or even an old tricycle. 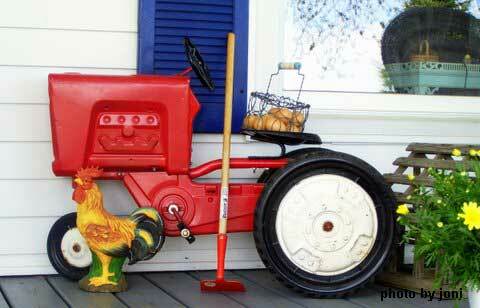 You can also find old hand gardening tools that you can place around the area to accent your country porch. Tie three garden tools together with a colorful ribbon and separate them to form a tripod. You could even place a small potted plant in the top. Because country decor is a reminder of days gone by, another country porch decorating idea would be to display various signs that you would find from that time frame. 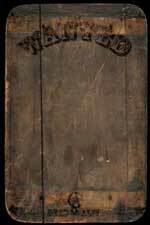 You can find primitive, old, rusted metal signs or even make some from wood that can be hung around your country porch. You can also place little wooden signs and markers in you flower pots and gardens. Feed stores and craft stores might be good places to locate signs such as these. If you have the room on your front porch you can add a front porch swing or two or you might consider some weathered Adirondack type country chairs. 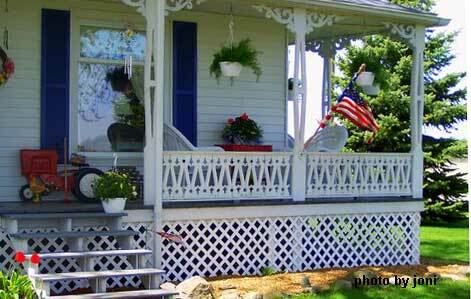 This country porch decorating idea not only looks great but also provides an inviting and homey feeling to your porch. Add a few flowers and herbs for a completely relaxing environment. 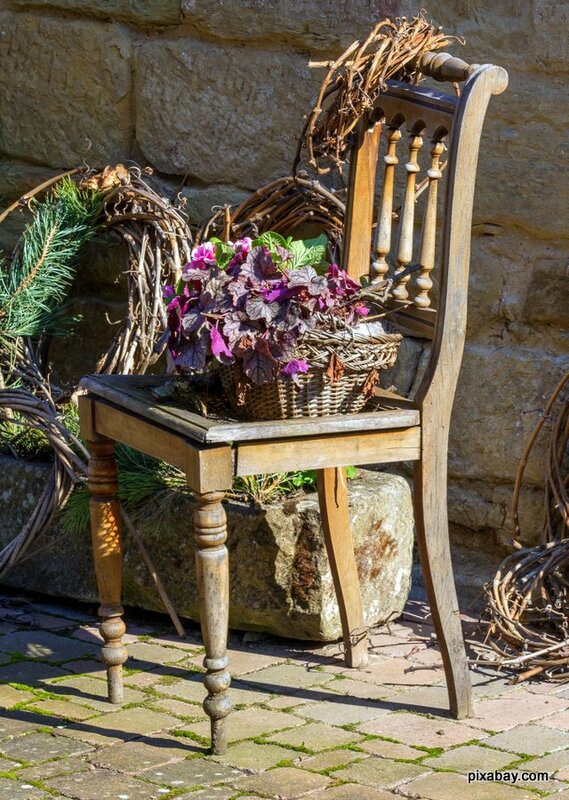 If you find that you are limited on space, maybe use a stool or bench to create a similar feel. Small wooden ladders can be used to add some height and dimension to your area and are also great platforms on which to place or hang flowering plants. A great way to create a country look is to use American folk art items like hitching posts, cast-iron windmill weights, old game boards like checkers, old jump ropes, weather vanes, buckets, and tools. 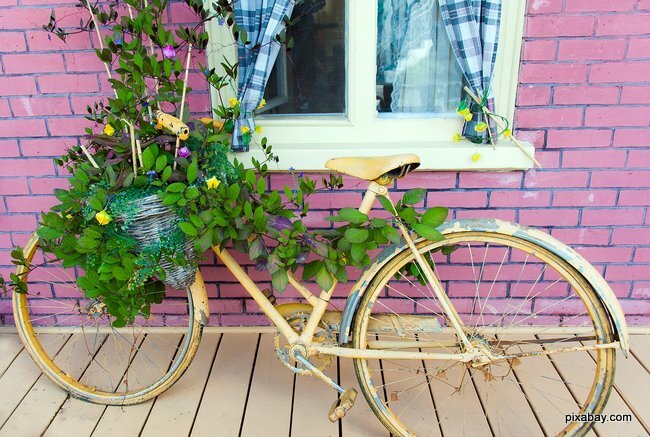 Use old frame and inexpensive paintings to create a small gallery on your porch. Here's a great color tip. Use a light palette and muted fabrics on your porch to create a light and airy look. Let your landscaping provide real color. Use our special porch color guide to select just the right colors for your country porch decorating. Or stop by Michelle's Craftsman farmhouse or Kimberly's Christmas porch. No matter what size porch area you have to work with, there are many different county porch decorating ideas around to help you transform your porch into a beautiful haven to be enjoyed by all. The fun and exciting part is experimenting with the many different front porch decorating ideas to find ones that complement your porch.